An all-blue finish in the G1 Golden Slipper at Rosehill has given Godolphin another spectacular day in its greatest ever Australian season. Kiamichi, an outsider in every sense, led home the Godolphin 1-2-3 in the world’s richest two-year-old race, jumping to the front and setting the speed to win by a length from her stablemate Microphone with Lyre a further half-length back in third place. The win was the first for trainer James Cummings in a race that is one of Australia’s most important, and he made it all the more significant by preparing the first two home. Third placegetter Lyre, the winner last month of the G1 Blue Diamond Stakes, is trained by Anthony Freedman. For Cummings the Slipper ranked as a triumph even before the field left the barrier, with five runners from his stable making it into the field of 16. Of that group, Kiamichi was the outsider and her task was made even more difficult by her outside draw in barrier 14. But her trainer hadn’t dismissed her. “One thing I knew coming into this Golden Slipper is that you can throw out the window the horse you think is the most brilliant, you can throw out the window the horse who’s had the perfect preparation,” he said. Kiamichi was such a horse. In November she was the stable’s first two-year-old winner. On Saturday she became Cummings’ 13th and the 15th for Godolphin in Australia this season. Between them, the Godolphin juveniles have won 25 races, including two G1s and the Magic Millions Classic. Cummings said of Kiamichi: “She was our first two-year-old winner of the season, she had the heart to get up and win on debut and she’s just kept on improving,” Cummings said. “She was trained for 1,200m all the way through and toughened up right until the grand final. Cummings paid tribute to his staff, praising their “meticulous” approach. “The guys have done an amazing job all season,” he said. The Golden Slipper win was the ninth G1 Australian successes this season for the broader Godolphin team whose successes include the Melbourne Cup, Caulfield Cup and Caulfield Stakes. Cummings also passed heartfelt thanks to Godolphin’s creator, Sheikh Mohammed, for whom he has now trained 11 G1 winners. The result was also a triumph for Sheikh Mohammed’s Darley stallions. Sidestep won three Stakes races for Sheikh Mohammed and stood at his New Sout Wales farm, Kelvinside. 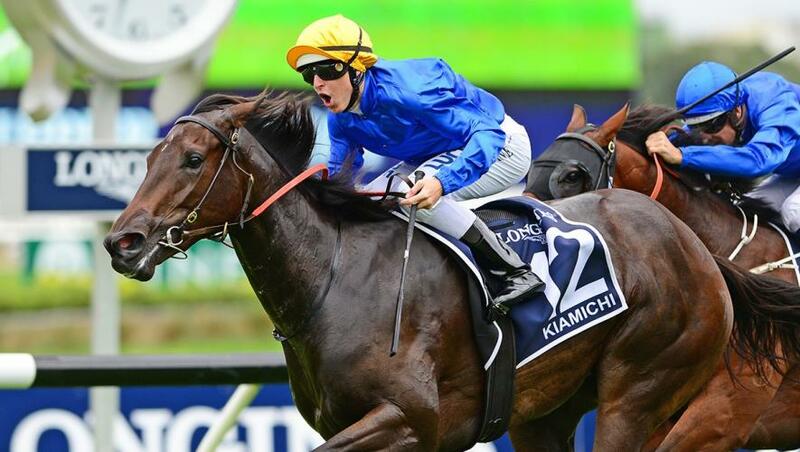 The runner up Microphone is by the inimitable Exceed And Excel and third placegetter Lyre is by Lonhro. The win also celebrated 40 years since Cummings’ legendary grandfather Bart Cummings trained the last of his four Golden Slipper winners. The Slipper result followed the victory earlier on the same card of Avilius in the G1 Ranvet Stakes. It was the first G1 success for the former French trained runner who has now scored seven wins in Australia, all in the current racing season.